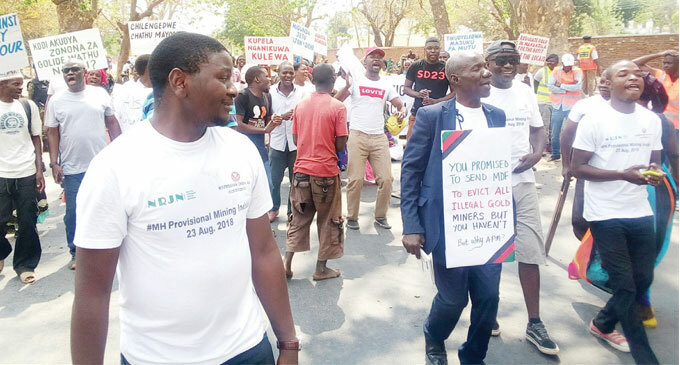 Civil Society Organisations (CSOs) network in Mangochi has urged the government to avoid being secretive on mining activities happening in the district. Mangochi CSO Vice Chairperson, Dickens Mahwayo, made the remarks Tuesday on the sidelines of a stakeholders’ meeting in which Sri Sai Limited and Ministry of Mines officials briefed stakeholders that the company would be conducting heavy metal sands exploration between now and October 2019. According to the ministry, Sri Sai was granted the exploration licence in 2012 but it was suspended due to illegal mining activities that are taking place in the district. However, Mahwayo said the CSOs and members of community in Mangochi are concerned that, of late, more companies have been engaging in exploration activities in the district but results of such exercises are not made available to the public. “We have been hearing about the granting of exploration licences for a long time. But we are not told about the results. This is a concern to us and the communities we represent. Failure by the government and the companies to provide us with results breeds speculation that the government is, perhaps, benefiting without the knowledge of the people,” Mahwayo said. He urged the government to consider speeding up the decentralisation process of the ministry’s mining operations so that companies doing exploration and mining activities could be held accountable at the district level. One of Sri Sai’s directors, Sureth Reddy, said, before they start exploration, they have lined up a number of community engagements to enlighten the public on the company’s activities. “We don’t expect to take huge samples as people are expecting. Additionally, heavy metal sands exploration is environment friendly such that we do not expect to damage the eco-system during the process. We hope that, by October, we would be able to know the economic value of heavy metal sands available in the areas,” Reddy said. Kondwani Dombola, acting Director of Geological Survey, asked the district council to work hand-in-hand with Sri Sai, saying people of traditional authorities Chowe, Namabvi and Makanjira might benefit from mining of heavy metal sands, which are said to be available from Malindi to Lulanga. Recently, CSOs in Mangochi staged a march against illegal mining activities, leading to the arrest of some people.